Learn about multi-factor authentication and how to create strong passwords, PINs, and passphrases while learning best practices for safely managing them in our Password Protection Series of modules. Password Policy - Learn how to make stronger passwords that are compliant with your company's password policy. Also includes hands-on practice creating them. Beyond Passwords - Explore options for securing devices and accounts. Learn how to create strong PINs to secure devices and the data they contain. This module also explores how to use passphrases to create stronger passwords. Password Management* - Users need strong, unique passwords for each account. Remembering all of those passwords can be difficult. 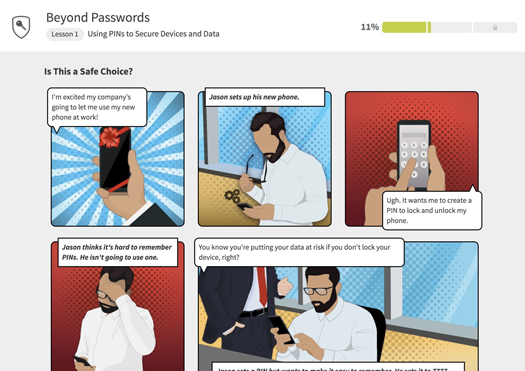 This module teaches strategies to help users safely manage their passwords. Multi-Factor Authentication* - In many cases, it's no longer enough to use only a password to protect our accounts. Learn how to effectively use multi-factor authentication (MFA) to safeguard important accounts.